Right picture from Henk of Holland website, used with permission. 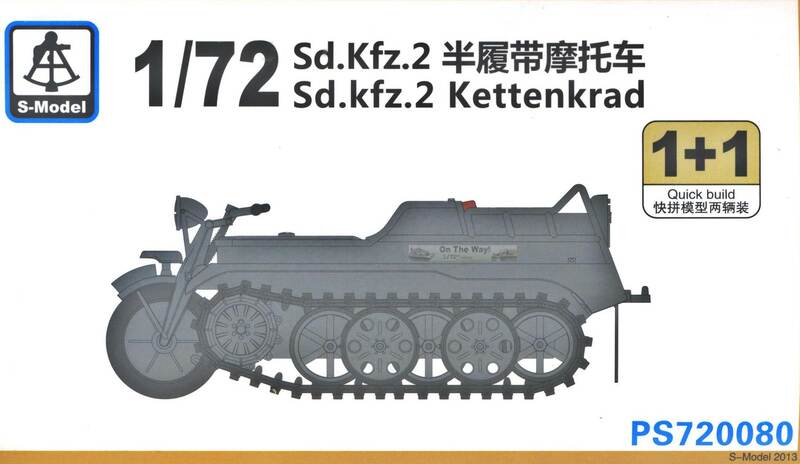 The history of the Sd.Kfz.2 Kettenkrad started with a small pre-production series (0-series) from July 1940 to the end of 1941. 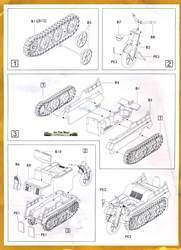 In the Summer of 1941 the vehicle was first fielded by the troops and only in 1942 series production started [1,2]. 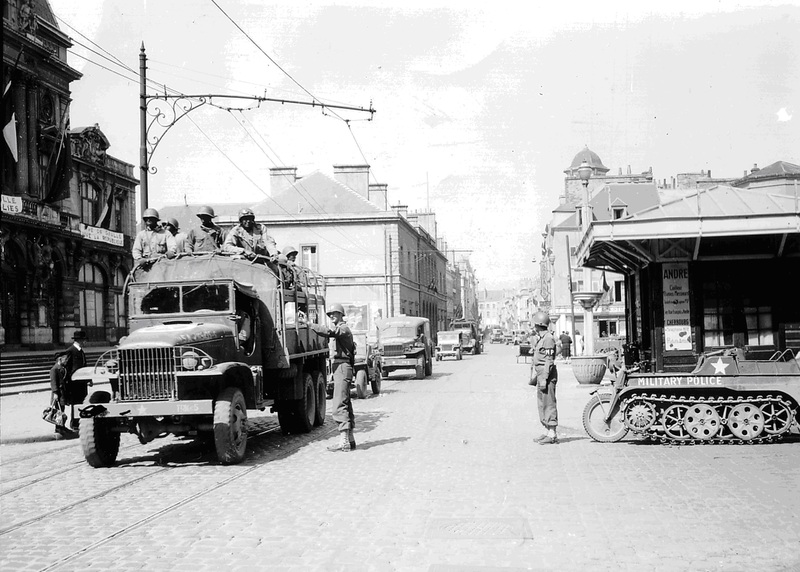 Production of the vehicle ended well after the war, in 1948. 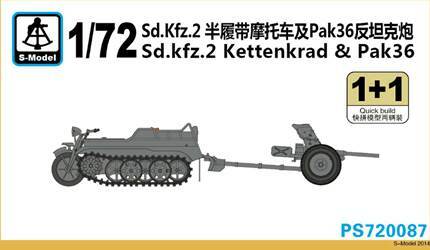 Apart from the standard Sd.Kfz.2, which could carry an especially developed trailer (the Sd.Anh.1), two cable laying vehicles were produced as the Sd.Kfz. 2/1 and Sd.Kfz. 2/2. 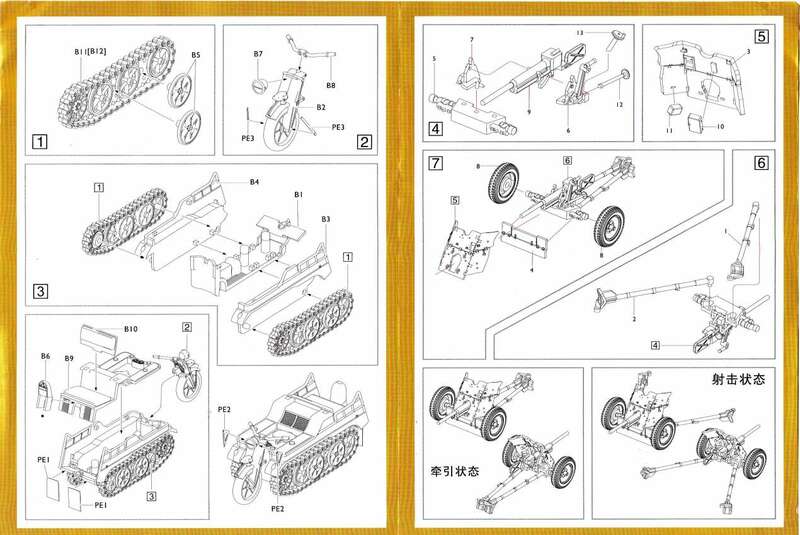 After a cautious start, S-Model has become one of the more prolific producers of 1/72 kits. This is one of their simpler releases, containing two identical sprues (and a small PE fret) allowing the construction of two Kettenkräder. No decals are included, which is a sad omission, as these vehicles at least carried licence plates above the nose wheel and at the rear, sometimes together with unit insignia. The single color option is also somewhat limiting (and, as we will see, misleading). Track width: 170mm (i.e. 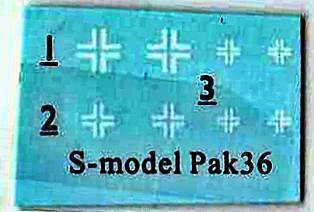 2.36 scale mm). For this kit we measure resp. 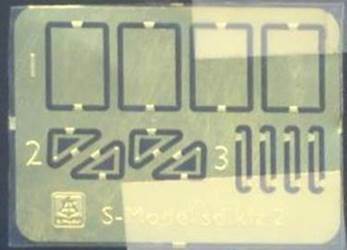 42.4, 14.2 and 2.3mm, which is between 1/70.5 and 1/74. In comparison, the Academy kit measures out as 37, 12.9 and 2.2 respectively, thus being closer to 1/81 in length and 1/77 in width (not to mention the large gap between the drive sprocket and the first roadwheel). Different production versions of the vehicle existed with minor differences between them. This kit is of the S1 series (a type-designator introduced by ) as it has 6-spoked roadwheels, signalling lights on the front fenders and (semi-)closed armrests. 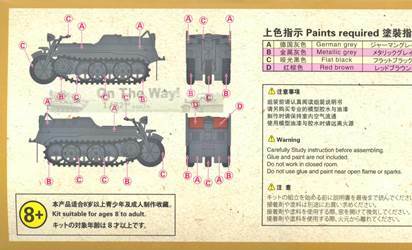 By removing the signalling lights, the modeler can convert the kit to an S2, while removing the signalling lights and the headlight will turn it into an Abschluss serie. Late vehicles also tended to dispense with the licence plate on the front mudguard or did away with the mudguard altogether. Backdating it to an M1 would require opening the handrails, while an M2 would require open handrails and a lack of signalling lights on the fender. The early vehicles also had larger holes in the outer roadwheels. (Note that these type-designators are not official names and dates of their appearance are unknown ). Based on contemporary photographs, it seems that the S1 was introduced after January 1943 and would thus have been painted in a basecoat of dark yellow, not the dark grey S-Models suggests. The first impression of the Pak is that it is a simple, but nice kit. As the price difference between kits 72080 and 72087 is minute, the latter is better value for money. 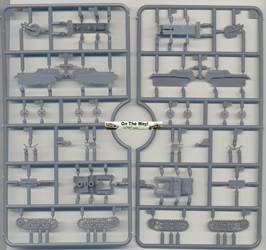 Note that the Pak sprue and decals are exactly the same as in kit 720142. The kit has no distinct edge between wheel and fork. I started my kits of as a quick build, but added stuff as I went along. I should probably have made a deeper groove in this area. I did add an extra groove to the edges of the seat rests, though. I lost one of the front fender supports, which are tiny PE parts in the kit. This turned out to be a good thing as it seems they were actually round not flat like the PE. 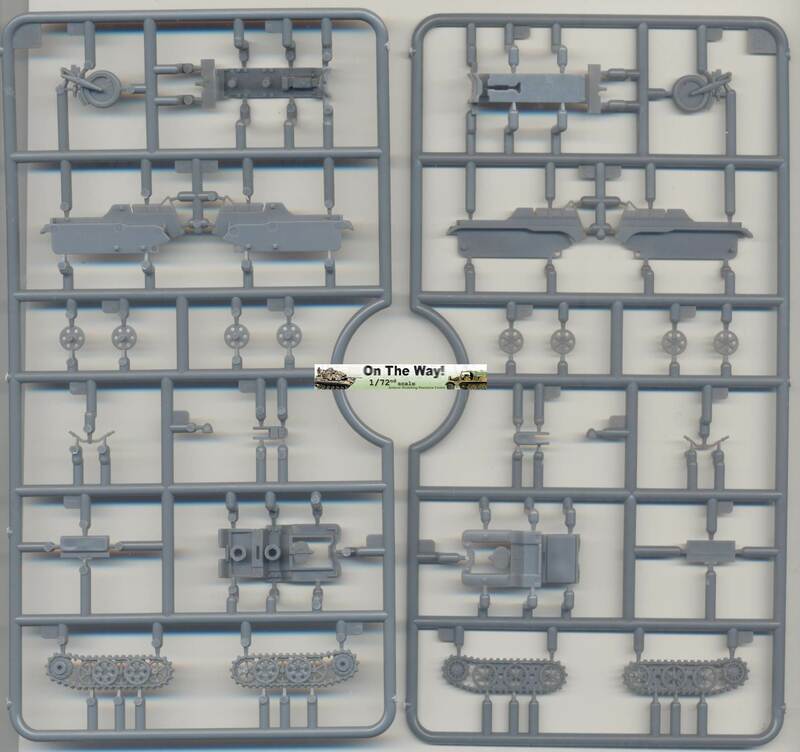 Stretched sprue is thus more realistical. The front tyre has no thread pattern whatsoever. I engraved a pattern without claiming any accuracy as I thought it would look better whatever I did with it. There is some interior detail in the driver's compartment, but a little bit more can easily be added. Like I said, I deviated from my quick build plans well after construction had started and should have done more work before closing the hull. Some levers go a long way, though, and can still be added as an afterthought. The trapezium shaped panels that cover the sides of the engine compartment in the kit are recessed. Some vehicles had a recess, while some had a smooth area here. The rear convoy light and front Notek light are rather nice. While the headlight comes with the triangular frame that fits it to the front fork, using this to keep the kit part in place is bound to give all kinds of trouble. I added a small pin to the rear of the headlight (B7) so that it has some support from the fork (B2). 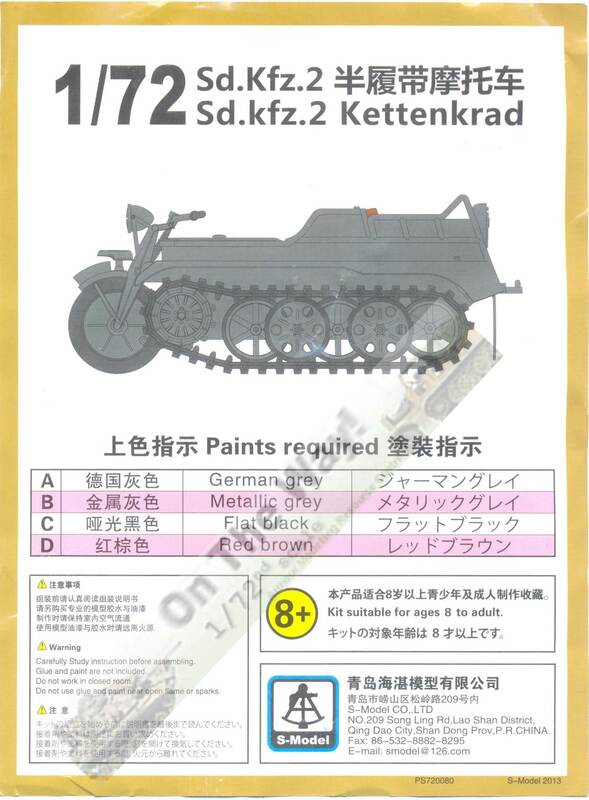 After having painted my kits, I noticed that many Kettenkräder had small stubs just behind the driver to support a box over the engine compartment. These were added at the last minute, after painting. I should have thought of this before and added the small fixing plates as well. The tracks are among the best I have seen from S-Model so far. A lot of Kettenkräder had rifle supports to the rear of the vehicles. Some were outfitted with tools or jerrycans. I didn't bother. The rear mudflaps are PE and, while nice, are a pain to glue to the hull. Next time I'll replace them with plasticard or metal foil. The roadwheels are nicely done, but are all in the same position, which is a thing all manufacturers choose to do (as far as I can tell). You might get some variation by positioning the separate outer roadwheels at a different angle, if you accept that in that case their holes will not be aligned with the inner row. Note that the inner roadwheels are represented as a single double-wide wheel, but it is easy to overlook. 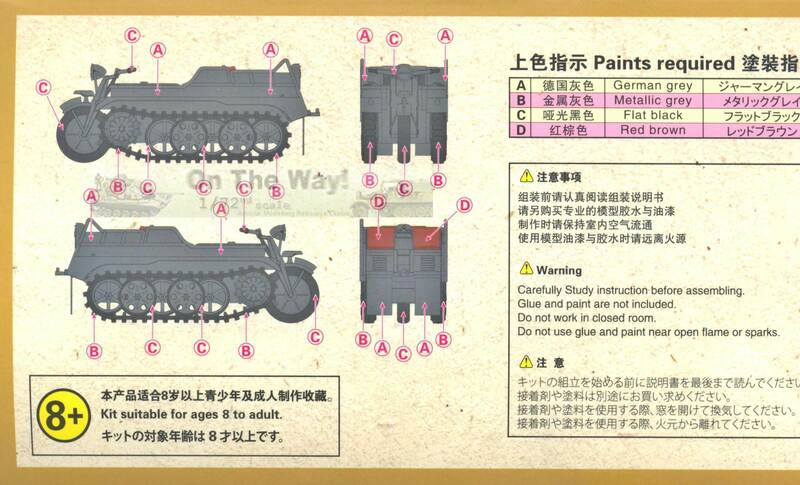 The decals for this model were custom designed by Aleran (now released as MS5). Almost finished model (awaiting decals and weathering). This model was built in almost identical fashion to the one above, with the exception of the kit-supplied (flat PE) fender supports. 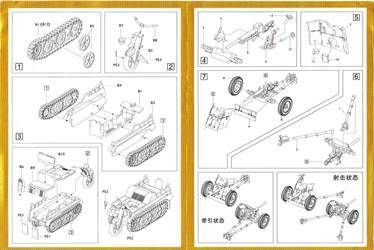 I discovered during the construction of this second vehicle that it is actually better to follow the instructions and add the top hull (B9) only after the rest of the hull has been assembled and the seems filled and sanded. This model got a more complete treatment. The driver's compartment was fitted out with a bit more detail, but more importantly, the whole front wheel assembly was reworked by separating the wheel and fork and building both up again with more realistic detail. The vehicle represents the final version, without headlight or signalling lights on the front fenders. The rear mudflaps were replaced with metal foil and an exhaust pipe was added to the muffler (underneath the rear hull). 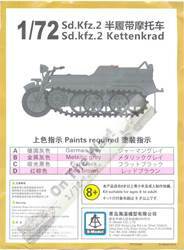 For modelers weary of staying on the beaten track we might add that the vehicle was popular with Allied troops as well, that some seem to have been driven without the front wheel assembly and that after the war a creative flower vendor gave a new life to his Kettenkrad. I decided to build one as a vehicle used by American MPs and commissioned custom made decals to complete it. The picture below was found at "Archives Normandy" (http://www.archivesnormandie39-45.org/), a site which no longer seems to be active and the picture only to be found here. It might be an idea to try and test Kora set C7210 (containing the cable laying equipment and trailer) with this kit. A more than decent kit, especially remembering that S-Model is considered a "quickbuild brand", and by far the best Kettenkrad in 1/72 available. With just a little bit of extra work, that I shied away from with my first kits , it can be turned into a real little gem. The only let-down is the lack of decals for the licence plates. Die Halbkettenfahrzuge, W.J. Spielberger. Band 6 der Reihe Militährfahrzeuge., Motorbuch Verlag. Preview samples purchased by the author.